We have come to expect it as an inevitable byproduct of an enjoyable holiday, almost as much as getting a suntan. When we take our annual break, we always seem to pile on the pounds. But, according to new research, the amount of weight we gain during a fortnight's holiday depends very much on our destination. Perhaps unsurprisingly, a study found that America, with its enormous portions and all-you-can-eat buffets, is the worst holiday spot for the waistline, with travellers gaining an average of 8lb in two weeks. But not far behind the USA, the neighbouring Caribbean is also one of the worst offenders with its all-inclusive resorts securing second spot in a ‘holiday fat map’. Those questioned gained on average 7.4lb on their trip. And two countries known for quality food rather than quantity also made a surprise appearance in the top five countries for holiday weight gain. France and Italy, with their wines, cheeses and pasta in the latter case are listed as the third and fourth in the study, with Francophiles gaining 7.3lb while abroad and Italian food-lovers a round 7lb. Greek tavernas are also to blame for that expanding holiday waistline, with holidaymakers noting a 6.9lb weight-gain while on their annual sun holiday. Researchers, who questioned 2,000 Britons on their holiday eating habits, found six in ten regularly gain weight and typically put on 5lb during their time away. But a quarter put on at least 7lb and one in 20 pile on a stone or more. 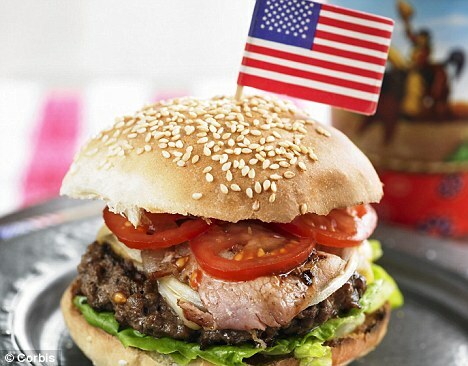 Britain took sixth place in the list of ‘fat destinations’, with over-eaters holidaying at home gaining around 6.8lb. Those visiting Spain, Portugal and Africa frequently return at least 6lb heavier. Half of those polled for the Obesimed weight-loss company blamed larger portions for putting on weight and the same number said it was down to ‘lounging around’. Four in ten said alcohol was at fault, one in six found it hard ‘saying no to seconds’ and one in five said free refills were responsible. The survey found half of holidaymakers only realise they have piled on the pounds after returning home. One in five notice the gain when looking through holiday snaps.